Widespread coral bleaching in the Northern Hemisphere coral reef regions provides an early warning that Australian reefs are likely at risk in the summer of 2016. AIMS researchers are gearing up a research program responsive to this risk. Record breaking summer ocean temperatures have led to widespread coral bleaching in the northern hemisphere. These hot conditions are predicted to extend into the Southern Hemisphere in the upcoming southern summer. The National Oceanic & Atmospheric Administration (NOAA) has now declared the ‘third global coral bleaching event ’, following the two previous mass bleaching events in 1998 and 2002 that have devastated many coral reefs around the world. Satellite data delivered through NOAA’s Coral Reef Watch program identify bleaching conditions and areas of risk, triggering the need for a response. Currently, the most severely affected locations are the Hawaiian Islands and the Caribbean. Closer to home, modelling predicts that a strong El Niño will continue to develop in the Pacific Ocean, which could cause bleaching in the Indian and south eastern Pacific Oceans in early 2016. This could put the Great Barrier Reef, Ningaloo Reef and some of the other smaller Australian coral reef systems at risk of similar widespread bleaching if warmer than normal ocean temperatures develop this summer. The Australian Institute of Marine Science has a long history in researching the impacts of climate change on corals and other reef organisms, including the causes and effects of coral bleaching. AIMS researchers have reconstructed past climate conditions, frequency historic bleaching events, monitored and modelled climate trends and future climate scenarios to predict how the reef is likely to respond to such changes. AIMS’ current work on adaptation mechanisms of coral reef animals is aimed at finding out whether some coral species and some locations might be able to cope with the effects of climate change, and determine the characteristics and locations that may provide refuge. 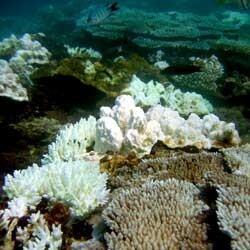 To be prepared for a possible mass bleaching event in the coming summer, AIMS is ramping up its targeted research to better understand coral responses to the predicted high sea temperatures, reef responses to cumulative pressures from climate change and poor water quality, and coral reef adaptation in a warming ocean. Building on baseline information, AIMS’ goal is to collect new data that can be directly compared to previous mass bleaching observations. The aim is to identify environmental conditions and management solutions that identify locations with the greatest tolerance and resilience to survive thermal stress events. The results of this work will assist the development of future management strategies for reef environments, particularly the Great Barrier Reef. How do the world’s largest fish – whale sharks – reach such immense sizes when they feed on some of the smallest prey in the ocean? The answer, according to a new study, is that whale sharks are very efficient foragers, using a combination of "yo-yo" like swimming to save energy and specially-adapted bodies to maximise heat conservation as they search for "krill" (tiny, shrimp-like animals) that they feed on in cold ocean depths. Dr Mark Meekan, Principal Research Scientist at the Australian Institute of Marine Science (AIMS), is lead author of the study and explains their findings, “Whale sharks are negatively buoyant meaning they naturally sink. When feeding, they allow themselves to glide gently down to the krill in deep water, which means they don’t expend much energy in swimming". “We estimate that this behaviour, followed by a steep return to the warmer surface waters, allows them to conserve up to 30% of the energy they would use if just swimming horizontally". “These ocean giants have another trick up their sleeve”, says Dr Meekan. “Their critical organs are surrounded by huge blocks of white muscle that appear to insulate the whale shark, so that it stays warmer for longer, even during these long descents to much cooler depths”. “For whale sharks, the larger they get, the more heat they can store and the longer they can forage in deep water”, notes Dr Meekan. “Because of this, we think they have evolved to become bigger and bigger, so that today they grow up to 18 metres long and can reach 34 tonnes in weight – larger even than many whales”. The scientists were able to record the swimming behaviour and location of whale sharks near Ningaloo Reef in Western Australia using sophisticated data and video recorders and satellite tags. 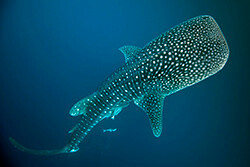 They found that whale sharks spent almost 60% of their time at the surface, where they bask in warm waters. “Whale sharks will dive down as deep as 500 metres and the water temperature can drop up to 20 degrees”, explains Dr Meekan, “they therefore need to spend a lot of their time at the surface to heat up again before pursuing their tiny prey in the cold ocean depths". “Unfortunately for these magnificent creatures being at the surface for such long periods can leave them vulnerable to encounters with large container vessels, tankers or even hunters". A Freedom of Information request initially started by Sea Shepherd Australia and then followed up by Shark Files Queensland, has revealed the staggering impact that the Queensland Shark Control Program has had on a large variety of marine life, including over 9,000 unborn pups. But even without these sharks being considered as by-catch, over 26,700 marine animals, including rays, turtles, fish, dugongs, dolphins and whales, some of which have Federal protections, have been caught by the program. The Australian Institute of Marine Science (AIMS) and James Cook University (JCU) are working with a team of US and other international researchers, to capture underwater videos of sharks and rays at 400 locations from little-surveyed coral reefs around the world. The survey, called the "Global FinPrint" is sponsored by Vulcan Inc., a Paul G. Allen company in the US. “This three year study is important to conservation and science as pressures on shark and ray populations increase. One quarter of the sharks, rays, and skates in the world are now threatened with extinction. These underwater surveys will assess and gather underwater video data that is needed to understand how best to protect reef species,” said AIMS scientist, Dr Michelle Heupel. “Globally a quarter of shark and ray species are facing an elevated threat of extinction. This research will help better to understand the status of sharks and guide decisions about how to protect them better,” said JCU Professor, Colin Simpfendorfer. The scientists will be surveying the reefs of the Indo-Pacific, the tropical western Atlantic, and southern and eastern Africa and Indian Ocean islands. The new data will be consolidated with thousands of hours of existing Baited Remote Underwater Video (BRUV) data to form a single dataset for analysis. The research is led by Dr Demian Chapman of Stony Brook University in the US. The team includes Drs Michelle Heupel, Aaron MacNeil and Mark Meekan from AIMS, Dr Colin Simpfendorfer (JCU and IUCN Shark Specialist Group Co-Chair) and Dr Mike Heithaus (Florida International University). The survey will also assist in understanding how marine ecosystems are affected in the absence of sharks. 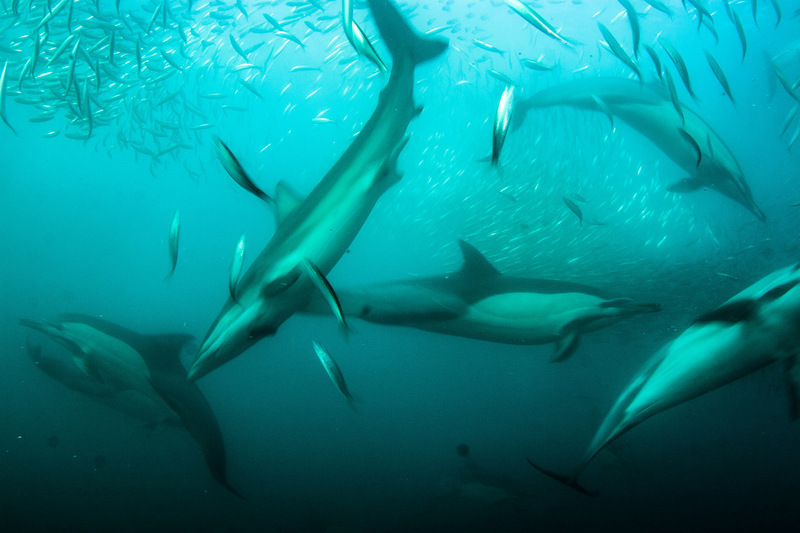 "Although sharks are among the most widespread predators in the ocean, we understand remarkably little about their overall role in ocean ecosystems. By surveying a wide diversity of reef conditions, we hope to understand just how important they are to the health of coral reefs and, ultimately, to marine environments as a whole,” added AIMS scientist, Dr Aaron MacNeil. As sharks are declining in numbers, this is important as many countries rely on healthy coral reefs for food security, tourism and coastal protection. “A key element of the project is that we will fund and enable networks of collaborators across the globe to participate in the work. Ultimately, this will be a project that involves a very wide cross-section of the community of researchers and stakeholders, including citizen scientists. Our project doesn’t just seek to document, we also seek to enable local researchers and to build capacity for better management outcomes” explained AIMS scientist, Dr Mark Meekan. Researchers, policy makers, international governments and others will be able use this database to help inform conservation priorities, such as identifying and protecting areas with large or important shark populations, and to better understand the ecological importance of sharks as apex predators. The Lennox-Ballina board riders club should be congratulated on attempting to bring the community together to find a common voice to the increasing shark encounters in the region. Community voices need to be heard on this topic. It is no surprise to me however, that without being given the opportunity to learn about the whole range of options available to them, and to then be surveyed on each option, the majority supported a cull of sharks. Without understanding the pros and cons of each option available, they have made an uninformed guess at what might work. The media frenzy that followed is also to be expected. Across the globe, people are being told "Australians want to cull sharks." When in reality, the situation is much, much the opposite. A small minority of people support a shark cull. And when given factual information on the options available, those figures reduce even further. 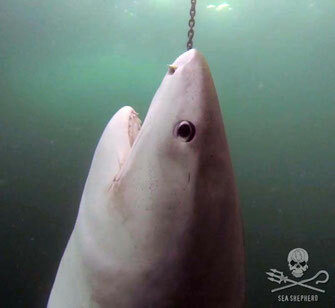 The NSW authorities do not support a shark cull. The WA community overwhelmingly did not support a shark cull. And generally, the Ballina-Lennox Head community are not supportive of a shark cull. But let's look as this further. New South Wales are already culling sharks... Thousands of predatory sharks are killed annually, mainly through commercial fishing and in shark nets. Yet shark bites and attacks continue to happen. Hawaii killed over 4,500 tiger sharks over 18 years and found that the level of shark attacks remained the same prior to, and after, culling sharks. It is my belief that people want something to be done and immediately. And this is understandable. People are scared. But decisions on how to protect the community should not be based on fear. Two immediate solutions which have been proven to work and available right now for the Ballina and Lennox Head community are a shark spotting programme and electronic deterrents. As a scuba diving instructor, I use a Shark Shield for peace of mind. This device was recently proven to work 90% of the time by the University of Western Australia. 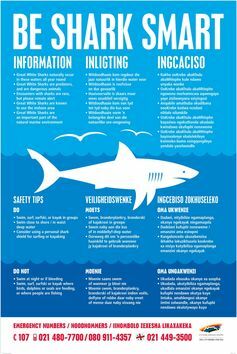 Given that we can not ever protect ourselves 100% when entering the habitat of wildlife, and that shark encounters are rare, I like those odds. 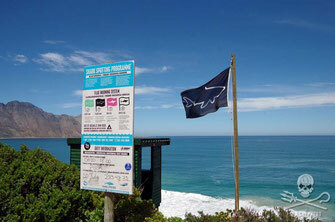 Shark Spotters is an initiative that started over a decade ago by volunteers specifically for the surfing community in Cape Town, South Africa. They use a system of flags and alarms to alert ocean users of shark activity at eight beaches from 8am to 6pm. 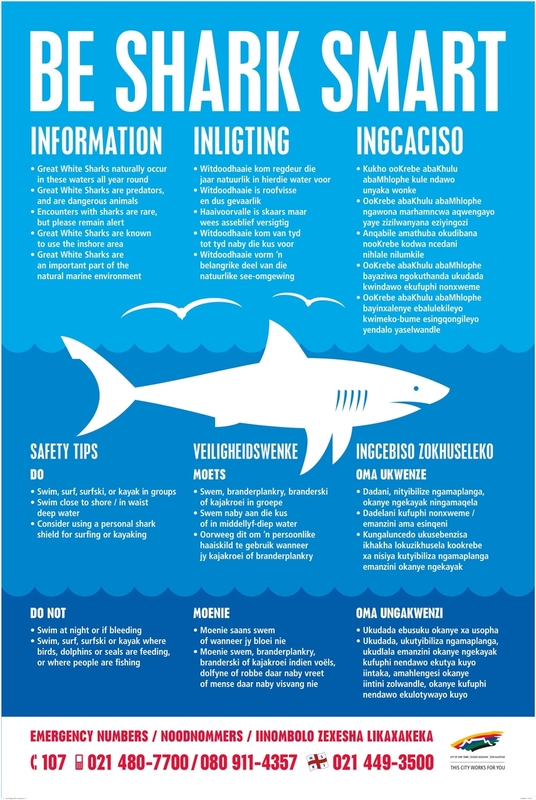 In close to 11 years they have spotted over 1,700 sharks and during this time there has been one fatality (low visibility spotting day and black flag up to indicate this) as well as a serious shark attack where the man chose to ignore all the warnings provided. It's time to get real about solutions on how to protect loved ones. Is the Queensland Government killing sharks and marine life without a permit to do so? Sea Shepherd Australia is demanding answers regarding the use of up to nine drum lines being used within the World Heritage Great Barrier Reef Marine Park without a required permit. After extensive conversations with both the Great Barrier Reef Marine Park Authority and the Department of Fisheries Queensland, Sea Shepherd has uncovered a range of discrepancies, the most damning being the use of up to nine drum lines by the Queensland Government, without permission from the federally governed Great Barrier Reef Marine Park Authority. Managing Director for Sea Shepherd Australia, Jeff Hansen is shocked that the Queensland Government could get this process so wrong, by not only using more drum lines than permitted, but also having discrepancies within the Department of Fisheries own public records. This request comes after Sea Shepherd uncovered an application by the Queensland Government to continue using drum lines in the Great Barrier Reef, lodged six years ago in April 2009, which to date has gone unanswered by the Great Barrier Reef Marine Park Authority. This was part of an investigation which led to a petition run by Sea Shepherd Australia requesting the removal of drum lines and shark nets within the UNESCO Great Barrier Reef Marine Park, attracting over 34,500 signatures. The petition was forwarded to the Great Barrier Reef Marine Park Authority in April this year, and Sea Shepherd is still awaiting a response. “These Government agencies are blatantly treating endangered and protected marine life with utter disdain, and should be completely embarrassed of the lack of importance they have placed on these issues. It shows a complete disconnection from nature and a lack of respect for our precious marine life and future generations” Mr Hansen said. 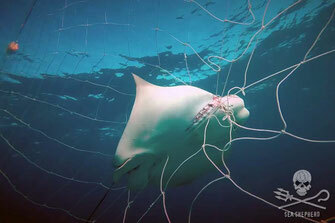 Discrepancies between the numbers of drum lines and nets used in Queensland depicted on PDF maps and within Excel spreadsheets can be found on the Department of Fisheries website page:https://www.daf.qld.gov.au/fisheries/services/shark-control-program/shark-control-equipment-and-locations - specifically Emu Park, Fishermans, Trinity, Yorkey’s Knob and Halloways beaches. While the discrepancies between the number of drum lines permitted and used can be seen when comparing the PDF maps and spread sheets to the Great Barrier Reef Marine Park Authorities permit (attached) – specifically Cooee Bay, Elmeo Beach, Florence Bay and Radical Bay. Researchers studying fish populations have uncovered the impact fishing has had on the world's coral reefs and charted a roadmap for the recovery of reef ecosystems currently under threat from overfishing. Coral reefs are home to thousands of species of fish and provide millions of people with food and income, yet reef ecosystems have been severely depleted by fishing. "By studying remote and marine protected areas, we were able to estimate how much fish there would be on coral reefs without fishing, and how long it should take newly protected areas to recover,” says study lead author, Dr Aaron MacNeil from the Australian Institute of Marine Science. As part of a global study into the recovery potential of coral reefs published in the journal Nature, the researchers examined more than 800 reefs around the world. They found that the vast majority of fished reefs are missing more than half of their expected fish populations. "Although fishing has more than halved fish numbers on many reefs, we were encouraged to find that substantial biomass remained where some form of management was in place. By keeping this extra biomass on the reef, people who chose to manage their fisheries dramatically increased their sustainability,” adds Dr MacNeil. The study found that most fished reefs would take about 35 years of protection to recover, while the most depleted areas would take almost 60 years. While marine reserves are the most effective way of recovering fish populations, the researchers agree that a one size fits all approach of locking away reef resources is not feasible for many communities dependent on fishing. “Changes in fishing practices can result in a significant return of key fish species over time,” says co-author, Dr Nick Graham from the ARC Centre of Excellence for Coral Reef Studies at James Cook University. “Fish play important roles in the overall functioning of coral reef ecosystems, for example in controlling seaweed and invertebrates. By linking fisheries to ecology, we can now uncover important ecosystem functions for a given level of fish biomass,” says Dr Graham. "Restrictions on types of gears, species caught, or local customs, all ensured substantial recovery in fish feeding groups. However, only completely closed marine protected areas successfully returned large predatory fish to the ecosystem," Dr Graham says. “Importantly, this new map charts a course for coral reef fisheries that includes everyone, not just those who can afford to wall off large areas." "These results give clear consequences for taking too much fish, and uncover the ecological benefits of different forms of fisheries management. The methods used in this study are simple enough that fishers and managers can take the weight and pulse of their reef and keep it in a healthy range that had not previously been defined." 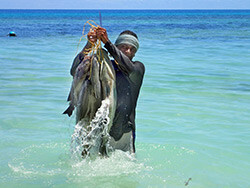 He adds that by choosing to conserve resources and the ecosystem functions they provide, fishers and managers have the ability to plan for recovery and help reefs remain productive in the face of increasing stress from climate disturbances. Examples of reefs that are heavily degraded and near collapse include those in Papua New Guinea, Guam, St Lucia and Antigua. Meanwhile, reefs that are doing relatively well under fishing restrictions include Australia’s Great Barrier Reef, Belize Barrier Reef, Pitcairn and Easter Islands. The University of Queensland were also key research partners in this study. Thirty years ago, a four-day weather forecast was a big deal. Today, thanks to advances in modelling, computing power, observation coverage and data assimilation, the forecast a week ahead is as accurate as the four-day forecast was in the 1980s. In 1985, the first compact disc was launched to consumers, the first “.com” registered, and Windows 1 was released. 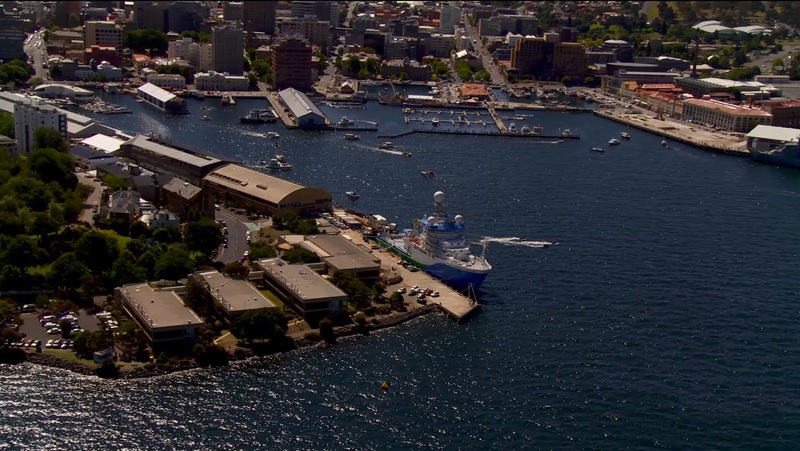 It was also the year that CSIRO’s marine laboratories were opened in Hobart, and Australia’s first oceanographic research ship was launched. The marine labs are one of the three key institutions of marine research in Tasmania, along with the Australian Antarctic Division and the University of Tasmania. Ocean and atmosphere scientists in Tasmania are the largest concentration of this field in the Southern Hemisphere, and Hobart is the gateway to the Southern Ocean and Antarctica – one of the planet’s two main “weather factories”. Since 1985 the labs have identified and found solutions to contemporary problems and researched others as they emerged to help industry and government to make crucial decisions. We developed the Atlantis ecosystem model, which simulates the marine environment and its interaction with human activities. It combines oceanography, chemistry and biology, and incorporates ecological processes such as consumption, migration, predation and mortality – as well as socio-economic factors. Using this modelling can help coastal communities make decisions about the way they live. It can also help industries, such as fisheries, oil and gas, shipping, ports, biosecurity and tourism, make decisions taking into account economic and social factors. Fisheries managers can now “test drive” different approaches to balancing resource use and conservation, instead of acting on best guesses. The United Nations rates it as the best ecosystem model in the world, and regional versions are being used to support management strategy evaluation in more than 30 ecosystems worldwide. Our research during the past 30 years on ocean and atmosphere observing systems and modelling has also played a major role in the development of ocean forecasting, seasonal prediction systems and state-of-the-art climate models. BLUElink predicts all types of marine weather scenarios, from local beach conditions to oceanic interactions on a global scale. It is like providing a weather prediction for the ocean. For example, BLUElink provides a forecasts of the oceans’ temperature, its salinity, and other conditions from the surface down to the sea floor. BLUElink provides a critical capability to Australia’s naval tactical operations, supporting Royal Australian Navy intelligence for tactical decision making and operational exercises. It helps to locate and map historical shipwrecks and hazardous areas. And it supports search and rescue efforts between Australia and other countries. The oil and gas industry has used ocean-forecasting techniques developed in BLUElink to assist with structural design, operational safety and oil spill management. The same techniques provided predictions of the spread of the 2009 Montara oil spill off Western Australia. Central to all this work have been our previous research vessels, RV Franklin and RV Southern Surveyor. With our new RV Investigator, we’ll now be able to travel further into the Southern Ocean than previous vessels, opening up new frontiers for research. With its eight dedicated research laboratories, plus other science-related spaces, RV Investigator can collect data ranging from the salinity of the deep ocean to the temperature of the air anywhere it goes, and carry out specialised research on board. Successive ships have supported our work on air sampling – vital for climate research. They’ve also been crucial to global research program initiatives on the ocean currents in the Pacific, Indian and Southern Oceans that help shape our marine environmental conditions that influence marine environmental and climatic conditions around the world. This sampling also includes the deployment of Argo floats as part of a worldwide marine observation and sampling collaboration of more than 3,750 floats. 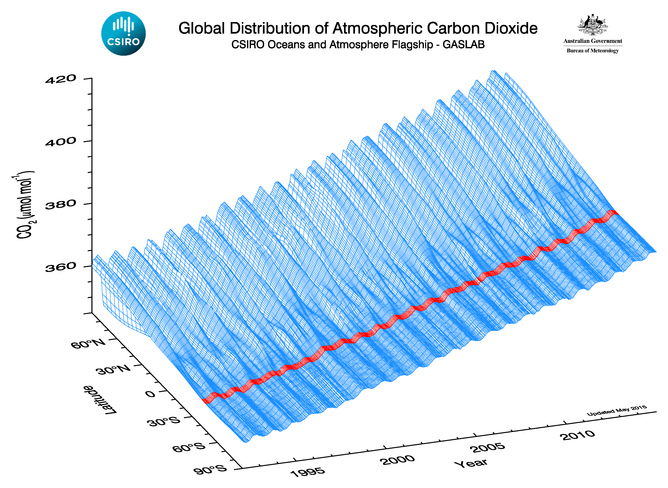 For instance, the data from the Argo floats have shown that the oceans are continuing to warm at a rate of 0.002C each year – a tiny figure that represents an enormous amount of heat. And that brings us to climate. Thirty years ago our model was a basic atmosphere with a slab ocean. Now we have an integrated Earth system simulator. This has had a huge impact on our ability to predict extremes and plan for disaster mitigation. Our improved climate modelling has also increased our understanding of both the El Niño/Southern Oscillation in the Pacific Ocean and the Indian Ocean Dipole. We now know, for example, that successive positive Indian Ocean Dipole readings are predictors of bad bushfire seasons. What can be predicted can be planned for. 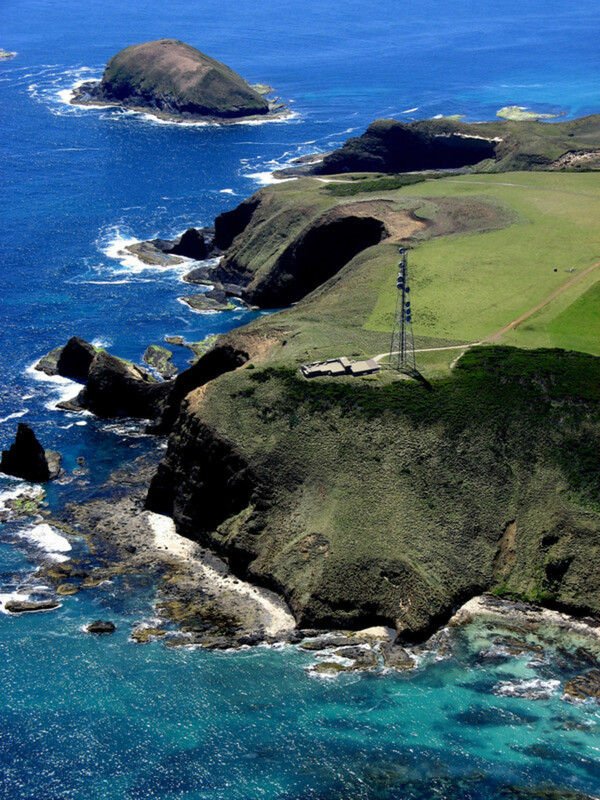 Our Cape Grim air sampling with the Bureau of Meteorology, too, has fed into our climate knowledge, providing the Southern Hemisphere’s first ongoing measurements of increasing CO2 levels in the atmosphere. It also monitors other atmospheric pollutants some of which, like ozone-depleting CFCs, are now showing declining concentrations. Importantly our modelling shows that the climate projections of 30 years ago have come true. Chasing The Earth is warming, sea level is rising, and weather extremes such as heatwaves are becoming more frequent. This knowledge and these projections can help us plan for the future. Kenneth Lee is Director, Oceans and Atmosphere Flagship at CSIRO. 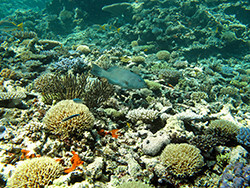 David Williamson, a co-author from the ARC Centre of Excellence for Coral Reef Studies said “We expected to see some declines in coral trout biomass on reefs that remained open to fishing after the rezoning due to the increased concentration of fishing effort on those reefs, a so-called ‘squeeze effect’. Instead we found that coral trout biomass remained stable on fished reefs in areas that avoided the impacts of Cyclone Hamish, while it increased significantly on green zone reefs. Ultimately it has led to an overall increase in coral trout biomass across those regions. It’s a really positive result for both the fish and the fishery”. The details of our findings suggest that effectively protected networks of no-take reserves will help reef fishes cope with some present and future stresses, and assist in maintaining coral reef fish populations as we know them”. To protect and manage environmental treasures like the Great Barrier Reef requires a strong foundation of science, but what should agencies and political leaders do when the science is as widely debated as it has been for dredging and disposal in the Great Barrier Reef? Over the past 15 months, we have led a process with a panel of experts to provide an independent overview of the current knowledge of the effects of dredging and sediment disposal in the Great Barrier Reef World Heritage Area. Our panel included a very diverse range of expertise and experience, from years in the dredging industry, to physical oceanographers and coral ecologists. The report, published yesterday, covers the effects of dredging on the physical and chemical environment, flow-on effects on the habitats and biodiversity, cumulative impacts, effects of land-based disposal, and next steps for management. The report shows, for example, that although direct effects are localised, dredging and disposal may have been making significant contributions to suspended sediments in inshore waters of the Great Barrier Reef. Given the complexity of the issue, the report can’t provide conclusive answers to all of the questions reef managers face, but it does provide a comprehensive and balanced interpretation of the available evidence. By clearly distinguishing what is known (and agreed by the experts), what is definitively not known, and what is uncertain (that is, still debated by the experts), the report not only provides a clearer way forward for managers, but clearly identifies the knowledge gaps we still need to address. So what does the report tell us? It says that dredging and sediment disposal can change the physical and chemical environment, and thus affect the biological values of the Great Barrier Reef World Heritage Area. But these effects will differ between locations, and also be influenced by the different types and extents of dredging and sediment disposal. Direct removal by excavation, and burial during disposal, only affect relatively small areas, although within those areas the effects are obviously severe. Dredging and disposal don’t occur on coral reefs within the Great Barrier Reef area. Both dredging and marine disposal create significant plumes of suspended sediment, causing increased cloudiness in the water and reducing the light available to marine organisms. Importantly, the report concludes that both disposed sediments and dispersed sediments from dredge plumes have the potential to be re-suspended and transported by waves and ocean currents, and to contribute to the long-term, chronic increase in fine suspended sediment concentrations in the inshore Great Barrier Reef. The extent to which this occurs and affects marine life was not agreed by the expert panel. In particular, the panellists had differing views on whether sediment from dredging was significant compared with background levels of resuspension and inputs of fine sediments in river run-off from catchments. However, calculations suggest that previous large dredging operations had potentially very significant effects. Most experts do agree that increased levels of fine sediments, and associated nutrients, are, along with climate change, seriously affecting the long-term health of the Great Barrier Reef. Understanding dredging in the context of inshore sediment dynamics is a serious gap in our knowledge. In general, dredged material from near the Great Barrier Reef has few chemical contaminants, and there are robust management procedures to avoid disposal of such material at sea. The report breaks down and summarises the risks to coral reefs, seagrass meadows, mangroves and estuaries, pelagic (open water) and seafloor habitats, along with the risks to fish and other wildlife of conservation concern, such as dugongs, marine turtles and seabirds. These effects will vary greatly with the location, timing and extent of dredging and disposal. But if dredging and disposal have been significantly increasing fine sediments supply, it is possible that long-term impacts on inshore ecosystems have been under-estimated. We know that chronic increases in suspended sediments have been affecting inshore coral reefs and seagrass beds. What is clear is that the extent of future impacts in the marine environment will be very significantly improved with the impending bans on disposal of capital dredging in the marine environment, recently announced by the federal and Queensland governments. The proposed ban on disposal of capital material in the Marine Park is open for public comment until this Friday 27 March. Following a ban on disposal of capital material within the marine environment, there remains the challenge of managing the remaining impacts of dredging, including disposal of maintenance dredged sediments in marine environments, and disposal of capital dredging material on land. The Expert Panel identified a number of potentially serious impacts and challenges involved in disposing of dredge material on land or in reclamation, including loss of coastal habitats, runoff of seawater and fine sediments from dredged material, and potential acid sulphate soils. Our panel prioritised identifying what we do know about dredging, but also found significant areas of insufficient knowledge. Most of the panel also agreed on the need to follow up our report with a similar analysis of the social, economic, cultural and heritage aspects of dredging and sediment disposal, including the impacts on Indigenous culture and heritage. Given the complexity of the Great Barrier Reef ecosystem, and the range of expert views, the intention of this process was never to provide a single, conclusive answer. Rather, our report provides a strong foundation for progressing both knowledge and management directions, and it appears it is already doing that.